Dr. Kenneth A. Bowman, right, chair of the Tusculum College Board of Trustees, presents a resolution from the Tennessee General Assembly of the State of Tennessee recognizing Dr. Nancy B. Moody for her contributions, hard work and dedication to the State of Tennessee and her community. Dr. Nancy B. Moody, president of Tusculum College, was recognized Friday, May 16, for marking her fifth year at Tusculum College and for her successful leadership during that time. She has served as president of Tusculum College since 2009. In recognition, Dr. Kenneth A. Bowman, chair of the board and 1970 alumnus of the college, presented her with a signed copy of a resolution for the Tennessee General Assembly recognizing her hard work and success. Dr. Moody was honored for her contributions to education and to the community, state and region. The resolution was requested by freshman political science student Montreal Fisher of Springfield, to recognize her contributions and was presented at the college’s Board of Trustees meeting. Since assuming the college presidency as the first female in Tusculum’s history to hold the position, Dr. Moody has faced several challenges. She led the college through a successful reaffirmation of accreditation process with the Southern Association of Colleges and Schools Commission on Colleges and guided the college towards greater financial stability. During her tenure, she has secured a $45 million Community Facilities direct loan for the construction of two new apartment style residence halls, a science and math facility and to refurbish an existing academic building. Dr. Moody led efforts that secured a $3.875 million gift for the naming of the Ronald H. and Verna June Meen Center for Science and Math that will be completed in 2016. 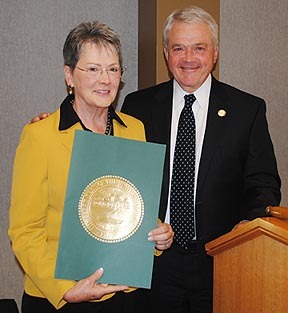 The college’s board of trustees recognized Dr. Moody’s contributions to Tusculum by presenting her with the inaugural Founder’s Award in February 2013. The Founders’ Award, named in memory of Rev. Samuel Doak, Rev. Samuel Witherspoon Doak and Rev. Hezekiah Balch, is presented by the Tusculum College Board of Trustees to recognize those who with integrity, tenacity, commitment, ingenuity and drive have moved Tusculum College forward in serving its students, its community and the world at large. According to Dr. Kenneth A. Bowman, chair of the Board of Trustees and 1970 alumnus of the college, Dr. Moody has embraced the opportunity to encourage faculty, staff, students and volunteers to push Tusculum College forward through creative teaching and learning, responsible stewardship and a renewed commitment to service and civic engagement. She has led Tusculum College into a new era of growth and expansion, in terms of bricks and mortar, academic programs and opportunities and fiscal responsibility. Under her leadership new academic programs have been systematically researched and implemented, including programs in nursing, chemistry and criminal justice. Additionally, a bachelor of psychology degree and a Master of Business Administration degree were added in the Graduate and Professional Studies program. Among other significant accomplishments in her first five years, Dr. Moody was instrumental in obtaining a $263,996 grant from the BlueCross BlueShield of Tennessee Health Foundation for the acquisition of a simulation laboratory for use in the nursing program and other health-related programs by Tusculum College students and staff and area community partners. The simulation lab is used to produce highly-qualified BSN graduates skilled at clinical decision-making, who will provide safe, competent and improved health care for future generations of Tennesseans. Partnerships with other institutions are at an all-time high. Tusculum College has arranged articulation and affiliation agreements with regional community colleges and professional schools to both increase enrollment in the bachelor’s degree programs, as well as afford expedited graduate school opportunities for alumni of Tusculum College. According to Dr. Bowman, Dr. Moody has successfully sought new gifts, donors and partnerships in order to ensure the success of the new and existing programs. Working with donors, foundations and government agencies, she has encouraged the investment of millions of dollars into Tusculum College’s growth over the past four years. “She has engaged with alumni and friends of the College, encouraging their continued interest and support in the institution. She has reminded all of the Tusculum community what it means to be a Tusculum Pioneer,” said Dr. Bowman. Prior to joining Tusculum College, Dr. Moody was president of Lincoln Memorial University for seven years. Under her leadership, LMU’s enrollment increased by 90 percent. The university also initiated the Lincoln Memorial University-DeBusk College of Osteopathic Medicine and expanded the Caylor School of Nursing to include a master of science in nursing degree program with family nurse practitioner and nurse anesthesia concentrations. Other programs initiated under her leadership included a master’s degree program preparing physician’s assistants and a doctorate of education degree. A registered nurse, Dr. Moody began her academic career as a nursing instructor for Lincoln Memorial University in 1974 and advanced to hold several academic leadership positions there – including dean of the School of Nursing and Allied Health – prior to being named LMU president. Her career also includes serving as the executive director of the Tennessee Center for Nursing, as an assistant professor of nursing in the College of Nursing at the University of Tennessee, Knoxville, and as associate professor and department chair in the College of Nursing at East Tennessee State University. She is a member of the Board of Trustees of the Southern Association of Colleges and Schools Commission on Colleges, chair of the NCAA DII South Atlantic Conference, and an advisory board member for the Northeast Tennessee College and Career Readiness Consortium funded through an Investing in Innovation (i3) grant funded by the U. S. Department of Education. Previously Dr. Moody served on the NCAA DII President’s Council, was chair of the Tennessee Independent Colleges and Universities Association (TICUA), and a member of the Board of the Appalachian Colleges Association (ACA). Dr. Moody received her associate’s and bachelor’s degrees in nursing from Eastern Kentucky University and earned a master of science in nursing from the Texas Women’s University Institute of Health Sciences-Houston Center in 1978. She also received a doctorate in nursing from the University of Alabama at Birmingham’s School of Nursing. In addition to the Founder’s Award, Dr. Moody has been awarded the Eastern Kentucky University’s Outstanding Alumna in the College of Health Sciences, the Hall of Distinguished Alumni, the Alma E. Gault Leadership Award from the Tennessee Nurses Association and the Texas Woman’s University Chancellor’s Alumni Excellence Award.